As destructive as It’s Always Sunny In Philadelphia’s five main characters can be when they’re making their scabrous ways around the City Of Brotherly Love, The Gang is most dangerous when left to their own devices. Sunny thrives on barely constrained chaos, The Gang’s five-headed madness only not doing greater damage to the rest of the world because of their collective incompetence and self-obsessed stupidity. But it’s when these five people—who only stick together because nobody else will have them—turn inward on each other that the knives come out, sometimes literally. In their home base of Paddy’s Pub—helpfully and understandably bereft of customers most of the time—Sweet Dee, Dennis, Charlie, Mac, and Frank have no one to torment but each other, resulting in, among other things, the game of Olympic-level cruelty, Chardee MacDennis. Christened “The Game Of Games” (Frank’s later attempt to add “Electric Boogaloo” is not considered canon), Dennis explains that this combination drinking game, gauntlet of physical and emotional abuse, and regulatory chaos came about when, bored out of their minds, The Gang “took aspects of a whole bunch of our favorite games and mashed ’em all together.” Charlie explains mournfully (and more succinctly), “It’s a war.” It’s also the basis for two of the series’ most hilariously concentrated examinations of how The Gang’s insanity can spiral to new depths. In both episodes, the competitive aspect of Chardee MacDennis essentially sees the five worst people in the world challenging each other, not just for Chardee MacDennis dominance, but for title of the worst of the worst. As in most wars on Sunny, teams are chosen, and siblings Dee and Dennis form a formidably sadistic pairing. The Golden Geese, as they dub themselves, routinely thrash Mac and Charlie’s Thundercats (the score is at least 20-0 at last count), leaving the ’Cats hopelessly hammered, humiliated, and with their already decrepit action-figure game pieces stomped into oblivion. Divided into three distinctly cruel, alcohol-saturated rounds (“Trivia, Puzzles, And Artistry,” “Physical Challenge, Pain, And Endurance,” and “Emotional Battery And Public Humiliation”), and weighed down by an overstuffed binder of obscure rules, Chardee MacDennis is the elaborately twisted product of The Gang’s collective, idle insanity. 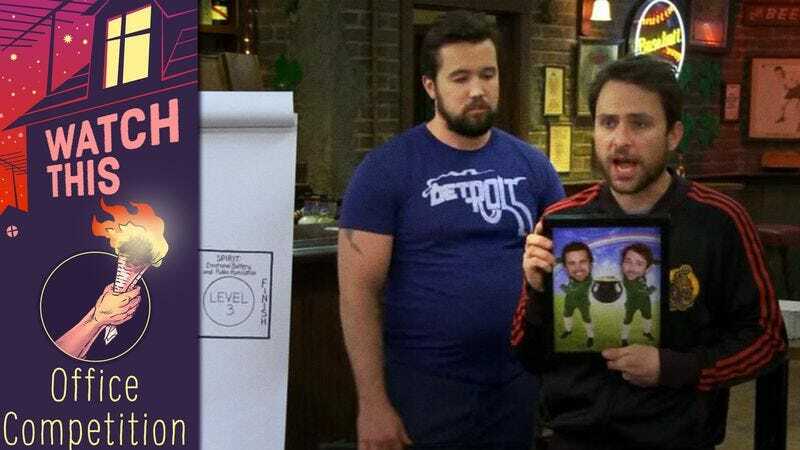 In both recorded “Chardee MacDennis” episodes to date, The Gang channels their craziness through their homemade endurance contest, providing more insight into just how deep their darkness goes. Dennis takes a dart through his hand without flinching, and creates a horrific sculpture that contributes to the running joke that he might be a serial killer. Frank, desperate to fit in, is locked in a dog crate, and crafts a team flag that has a distinctly fascistic vibe to it. Mac routinely becomes so enraged by failure that he tries to destroy the game board. Dee is revealed to have withstood a full two hours of emotional battery in a past contest, resulting in a month of profound post-game depression. And after Frank attempts to hijack the follow-up rematch with a Saw-inspired fourth “Horror” level in the sequel, Charlie plays to type, landing himself in the hospital after following the game’s rules in the most painfully literal way possible. Laxatives, broken glass, fire, deceit, offensive ethnic accents—Chardee MacDennis is the product of five variously demented souls with no outlet for their ingeniously juvenile madness but each other. At least, for the people of Philly, it keeps them off the streets for the day. Availability: It’s Always Sunny In Philadelphia is available to stream on Amazon, Netflix, and Hulu.